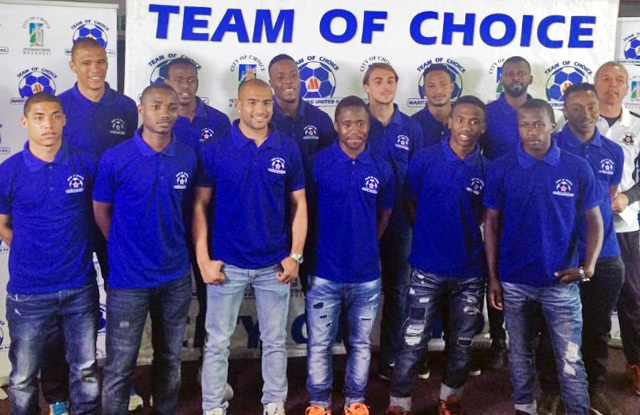 Maritzburg United chairman Farook Kadodia on Tuesday announced the club's new signings, transfer updates and general club news ahead of the 2016/ 2017 season. Good day everybody. A special welcome to the members of the media, your presence here today is appreciated. The main purpose for having this press conference is to inform you so that you will in turn inform the public, about player movement at Maritzburg United ahead of the new season, more especially the players that we have signed. However, before I do that, I would like to take this opportunity to touch on a couple of issues that will assist to put things into perspective. It is common knowledge that we had a very unlucky, frustrating and stressful season in 2015/16. It was difficult to comprehend as to how come a team that was considered by many, to be playing well, got stuck at the bottom of the log table for the entire season. It almost became a norm that if we scored two goals, the opposition would score three. If we scored one, they would come back and score two. And the habit was that we would concede at critical times during the latter part of the game, small wonder we found ourselves having conceded the most number of games in the League. Having said that though, our plans for the pre-season were affected by the unexpected changes in the coaching department which resulted in a false start that we could not recover from, until week 29 when we moved from position 16 for the first time, to 15 and then week 30 when we moved further up to 14 in the last 10 magical minutes of the season. The arrival of Coach Ernst Middendorp, brought about an improved mindset and fighting spirit that saved us from relegation. We are grateful that we have a continued relationship with the Head Coach, having signed two more seasons with us. The implications of this relationship is that we are having a fully prepared and planned pre-season. Also that we have reinforced the squad in consultation with the Coach for a much more improved performance this coming season. We do not have the luxury of a big budget to attract a whole lot of big name quality players like some of our counterparts, especially in Gauteng. Whatever we have available, we have to invest wisely and still be competitive. You will realise as I present the new players to you that we have done our best to secure quality players within the limited budget we have. We are confident that we are going to be really competitive come new season. To make up for the limited budget of buying players, we are directing our energy into establishing a Football Development Academy, which will help us not only produce our own quality players, but will be a source of revenue for the club as well. As a Pietermaritzburg based Club, an Academy like this will benefit mainly talented young boys from Msunduzi Municipality, our sponsors, and KZN in general. Obviously identified extra-ordinary talent from beyond KZN will be considered favourably. It is on the basis of that vision that we have approached the Municipality to assist us with infrastructure for the establishment of such an Academy, and we have identified the Wanderers Bowling Club for this purpose. The MultiChoice Diski team, is another very important leg of the Club that must be consistently strengthened to serve as a feeder to the team. Most recently, we conducted trials for under 23 as well as under 19 where hundreds of aspirant young players turned up to try their luck. Out of those trials, we signed three players for the SAB and Diski Teams. We are hoping that the Diski Team will continue the momentum and improve from last season where they ended up on position four. We are happy to announce that we have promoted three players from the Diski Team who have signed contracts with the senior team. Please note that the players that I have not mentioned in any of the lists I have gone through, means that their contracts with the club are still firmly in place except for Manti Mekoa, we are still in discussion with his agent. I now take this opportunity to welcome all the new players to Maritzburg United, the Team of Choice. I am looking forward to a happy and productive relationship between the Club and yourselves, so that when the time comes for you to leave, you shall have left behind a legacy of achievement that would go down in the history of this Club, the City and the Province of Kwa-Zulu Natal. I THANK YOU.